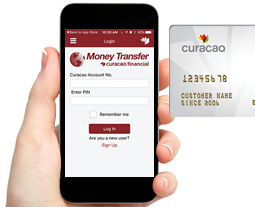 Use your Curacao Credit to send Money* (upon approved credit) Apply here. Recurring services: Tell us who will receive your remittance, where and how much, and it will be sent automatically per your instructions. Transfer funds 24 hours a day by phone, using interactive voice response technology and Curacao Credit. Calls processed in English or Spanish. Send money using your Curacao Credit*. *Curacao Credit (and the Curacao Credit Card) is provided by Adir Financial, LLC (or it's parent, Adir International, LLC), a related company of Adir Money Transfer Corp., dba Curacao Financial. Present your Curacao credit card to one of our Curacao Financial associates. The remittance will be processed taking the funds from your Curacao credit account. Your family and friends will get the money they need quickly and easily. You have 30 days to make the payment to your Curacao credit account. With over 30 years of service to the community in California and Arizona, Curacao gives you the confidence you need to send money safely. Register your profile visiting a kiosk inside any Curacao store, tell us who will receive your remittance and where. It will only take a couple of minutes and your money is received instantly in the financial institution of your choice. For you: Select the best way to send money; visit one of our kiosks, setup by telephone, set up automatic recurring transactions, or via https://www.curacaofinancial.com/NewBeneficiary.aspx For your family: Your beneficiary can choose to receive his/her money in a location of his/her preference. They can receive in cash, direct deposit, or bank account. STEP 1- Subscribe to the recurring service. Ask a Curacao Financial representatives to activate the “Recurring” service. They just need to know the date, amount, and the beneficiary’s name. STEP 2- Auto send money using your Curacao credit account*. Curacao Financial can take the funds from your Curacao credit account or bank account. The money will be sent to your beneficiary automatically. STEP 3- Receive the authorization number on your cell phone. Curacao Financial will send you the authorization number to your cell phone via a text message. You will have to provide this number to your beneficiary in order to receive cash or let them know that the money has been deposited to their account. Click here to see the most frequently asked questions for this service. Use your Curacao Credit* or your Visa, Master Card and Discover.